One of the first groups in filmmaking to push back on 360 video happened to be directors. Filmmakers who pride themselves on being able to tell exquisite visual stories and do not want the audience messing it up by looking around. We (the evangelists) pooh pooh’d this and said “if we create visually compelling imagery, the audience is hard wired to look where we want them with queues such as light, movement and spatial audio”. This sentiment holds true, but i don’t believe it fully fleshes out what can be done within 360 “spherical” imagery. Head Mounted Displays (HMD’s) and phone based app viewers often give us approximately a 90 degree view. This is inside the approx 200 degree view that we can utilize whilst in a seated position NOT in a chair that rotates, just by turning our head and using peripheral vision (assuming full flexibility, which is very often not the case with my elderly viewers. But when you put that headset on, what do you see? You see a big rectangular image, not so unlike a movie screen or tv. You don’t see the whole image, not even close, until you start looking around. So that immediate first image, that first impression is what sets the stage for the rest of your experience. That first image shouldn’t be a random shot with a 360 camera placed in the center of a space, it should be a well thought out shot, framing some subject matter in a way that captures the viewers attention and draws it in. 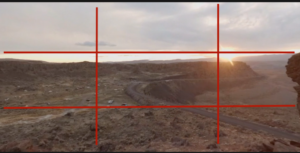 Continuing on that theme, consider shooting sequences from different points of view. Don’t expect the subject to carry the whole scene from one camera placement. Get your wide establishing shot, get your closer shots, get your reverse shots, get your unique shots. Don’t give in to idea that the gimmickry of 360 holding the audience attention on its own. That time is past (or nearly past), we have to step up our game and be filmmakers and story tellers via carefully crafted visual imagery, no matter how our audience is consuming it: standard flat video, 180 degree, or 360. Smart phone viewer, HMD, dome, cylinder, you name it, the combination of story and beautiful imagery is what will keep your audience engaged and coming back for more in the long run. Not so unlike classical (flat) filmmaking and photography advice being given to the enthusiastic noob, no? Of course rules are meant to be broken but still, there is a reason that some types of shots and shot sequences were sorta settled on. They just work. They work for most of the viewers most of the time. So i guess what i’m saying is, topside or underwater, break the rules with this new medium but not all the time. You can do more wild creative shots in 360 space, but there will always be the classically framed shots that you can do in 360 (keeping in mind that you can and are shooting for a field of view) just as readily. You may not get all the magic tricks & tools you can get in flat filmmaking like shallow DOF (without some cleverness in post) but there is no excuse for poorly framed shots/orientation. I believe we are on the upswing for this beautiful engaging medium, and it will be up to us as creatives to continue to nurture and grow it, and keep the momentum by making content that people not only want to watch, but want more of. Some examples (not perfect mind you, but at least I’m trying) 😉 On the left is the shot as seen in a viewer and on the right is the equirectangular.